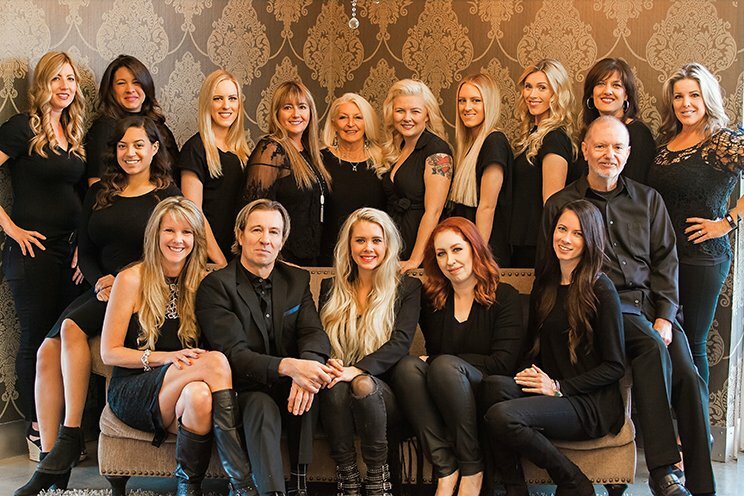 Some of the most frequently asked questions about our The Right Hair salon in Ladera Ranch, Orange County, can be found here. Click on the links to learn more. Why choose The Right Hair Salon over another salon? The Right Hair Salon is widely known as the go-to, elite salon in Ladera Ranch, staffed with warm, friendly and talented hairstylists that offer superb work every time. Always focused on staying ahead of the fashion curve, our stylists continually attend educational seminars and updates to keep abreast of the latest trends and techniques. Our hairstylists love working at The Right Hair! The majority of them have been with us since we opened. That kind of loyalty speaks loudly for the positive and forward thinking atmosphere that we welcome you to experience. 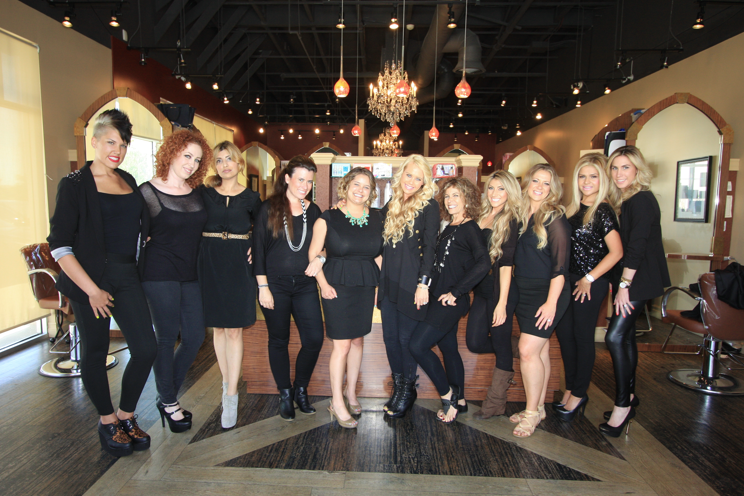 Chic and sophisticated, The Right Hair is Orange County’s favorite salon for top-notch talent and superior results, complete with a luxurious variety of complimentary beverages from mimosas to vanilla lattes. How often do your hairstylists recommend getting my hair done? The frequency of getting your hair done differs from client to client and depends on your preference. But as a general rule, our hairstylists recommend coming in every 6-8 weeks to maintain the shape and color of your current hairstyle and every 12-14 weeks if you’re growing your hair out or your hair is not colored. What products do you recommend for the healthiest looking hair? At The Right Hair salon, we recommend using a moisture shampoo and conditioner, such as Colure or Rene Furterer, that are sulfate and sodium chloride (salt) free. If your hair is long and color treated, we recommend using a leave-in conditioner, such as It’s a 10 with heat protection, after the color-safe shampoo. We also recommend using an oil treatment on the ends to prevent them from splitting. Can your hair salon show me how to manage excessively frizzy hair? Our hair salons in Ladera Ranch and Mission Viejo remind you not to worry; excessively frizzy hair is a common problem in Orange County. The Right Hair salon in can help you with several products and treatments that can add a significant amount of moisture to your hair. For a nourishing oil, we recommend Rene Furterer Karinga, an excellent product offering quick results. For excessively frizzy hair that a oil can’t tame, we highly recommend the Keratin Complex or Brazilian Blowout. These services last approximately 3 months and works wonders to eliminate frizz and leave you with soft, silky, flowing hair. My hair is damaged and dry. What do you recommend to repair it? First we would recommend getting a trim to remove the unhealthy ends. Then we would suggest an Olaplex strengthening treatment, followed by moisture repair mask such as Colure Richly Moisture. Ombre is the effect of having colors or tones that fade into each other from dark to light. Balayage is a free form highlighting technique. Color is painted on the individual strands of hair. This technique offers a more natural look to highlighting hair by doing away with the more uniform foiling process. Are your make-up artists available for bridal and special occasions? The Right Hair salon make-up artists are indeed available for all your special events, including bridal, prom, and graduation. Our professional artists offer make-up application events on location and in salon. We welcome bridal parties of all sizes, and can handle large events with ease. We’re here to fulfill all your wedding make-up and special event make-up needs. The Right Hair salon offers the highest quality 100% real human hair wefts (braided and beaded), tabs, beads, flat-tracks, and clip-ins, from such high level companies as DreamCatchers, Hotheads, and Great Lengths. How damaging are the hair extensions I would receive at your salon? The Right Hair salon uses extensions that are considered very safe for your hair. In fact, many of our stylists wear or have worn hair extensions themselves and are delighted share their experiences and suggestions with you. Visit our salon for your free consultation to learn about the types of hair extensions we offer and find out which ones are just right for you. If you have any further questions, please don’t hesitate to contact us today!